Dolls freak a lot of people out; this I know. I, personally, have a morbid fascination with them. 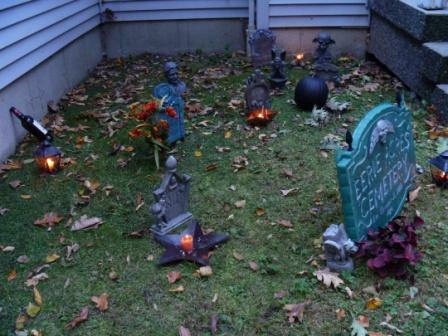 So when I wanted to build a cemetery as a decoration in a very small corner of my front yard—in fact, it’s square tucked next to the front stoop that’s just about the size of a cemetery plot—I decided I wanted to do it doll-sized. 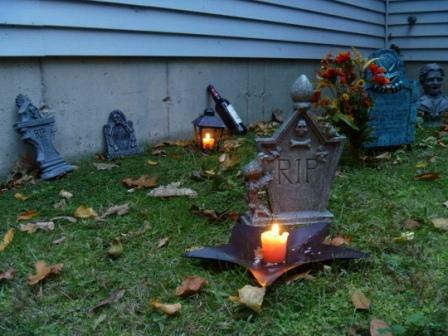 With all of the crazy Halloween decorations I see outside people’s homes—some quite intense, complete with blood-covered zombies and screaming dead things popping out from behind tombstones—I am always surprised by my guest’s reactions to my miniscule handiwork. I’ve had a few people tell me it actually spooks them and they don’t like walking past it. 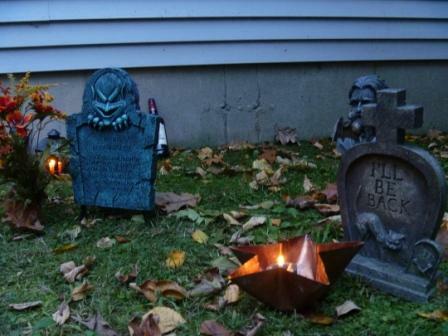 Perhaps with Halloween decorations, just as in any ghost story, subtle is better. 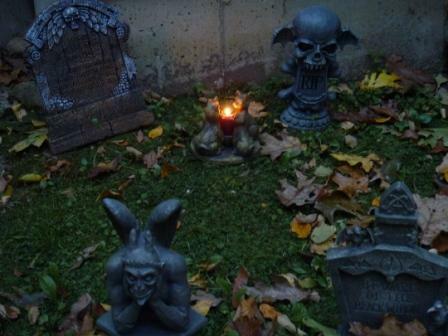 Following the pix, an unpublished short story of mine called “Grave Season.” It hasn’t even been submitted anyplace—in my opinion, it could still use a little work. But I wanted to give everyone a virtual treat, so here it is. It was inspired by the many October cocktail hours I spend up at a little-known cemetery with some friends. Enjoy. And may the dead respect you the next time you walk past where they’re buried. A thermos of Manhattan, baby wipes, garden gloves, a 1978 tape recorder with a broken play button. A cassette of Hermann’s The Day the Earth Stood Still score. Candle, lighter, cigarettes. A shoddy, wine-stained picnic blanket. A wool hat, hay bale, railroad stake. A hammer. This is her cemetery gear. Actually, she thinks of it capitalized, in a sleek, clean sans-serif logo: Cemetery Gear. Tag-line: everything you need for a peaceful evening creating among the dead. She could even tailor the kits to specific types: for the academic tweeds, pipe accessories and quality tobacco, something with the tang of a Cavandish but not the heaviness of it, or something fused with berry, or a straight Latakia. She wouldn’t make a fortune, but if she niche-marketed just right – to the Bohemians and artists; to the small country townies who didn’t have anywhere to go and gather in their dry communities; to the city writers who only had Central Park because they hadn’t thought of a cemetery as being a getaway all their own – she could maybe make a good living. For every artist, Grave Season should be a way of life. She writes what she needs to sell all year in just three short weeks. The October crisped smell in the air is what makes her break into a sweat like the kind she gets after consuming too many chili peppers. The sweat is a signal that it is time to splash into the back of her closet and unearth her flannels; a harbinger that her sacred place is ready to open its arms. The sweat is a signal that hundreds of lines of poetry are about to spew forth from her pens. Oh, she has plenty a patch of grass behind her dank basement apartment, she does, but despite the broken-down swing set she had lifted from someone’s yard sale that she’d hoped would make it a more inspiring place, it is beige, boneless; the leaves blow away instead of bowing down to embrace its edges. She gets no inspiration there. Something has to be dead before something can live, this she knows, and her yard is fallow. She’s aware those around her would look upon this as not just kooky, but bizarre, so she lets the afternoon drip off the leaves’ brittle tips like paint from an atrophied brush before she deposits her gear in the hatchback and heads north, the vile banks of a pregnant stream clawing the edge of the road. The people who have seen her pull out of her driveway probably think she is running as innocent an errand as the store, or, if they think better of her, out with friends for a bottle of Pinot. She is happy with that. They’ll never know that joy of rounding that corner by the dilapidated farmhouse that has one of its windows boarded up because the owners probably can’t afford a replacement so close to Christmas. They’ll never know the tingle of racing down the winding dirt road that descends into a lavender valley throwing up praising hands of fog. 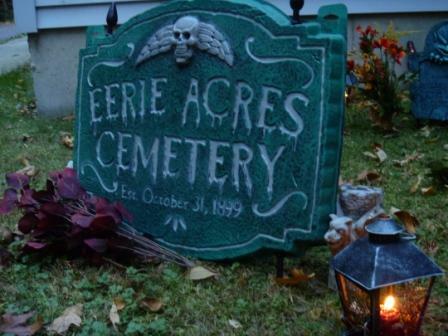 They’ll never feel the sting of tears at that very first glimpse of the cemetery’s welcoming white picket fence. They’ll never know what it is to roll the car beneath a stalwart line of oak trees, pop in the soundtrack, pour the first Manhattan, light up a cigarette, feel the bite-chill on an exposed neck, and wander among the dead, writing implements in hand. When she arrives every October 8 the first thing she does is check on the status of her old friends: ALMIRA, WIFE OF DANIEL A. TREAT OCT. 31, 1888, 56 YEARS 16D AT BEST. A.A.W. the foot stone, a white tooth sugared with mold cavities, actually loose enough from the earth she can pick it up. The rhyme is key. The rhyme fascinates her year in and year out. It has spawned many a poem that went on to the pages of The New Yorker. She hasn’t figured out the answer to the riddle, but every year, she tries. Every year, she comes up empty. NATH’L SMOTE ESQ’R WHO DIED SUDDENLY JANUARY 11 A D 1801 AGED 46 YEARS 10 M’THS & 29 DAYS is tipped over. She cringes when she runs her fingers across the new break, rough and sharp like crystal canyons. 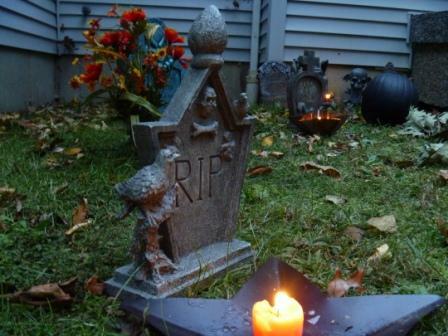 When a gravestone is tilted over or broken from natural causes, the spirit is wandering. NATH’L SMOTE is wandering. Somewhere in this cemetery, NATH’L SMOTE is wandering, wondering why somebody woke him up. She tries to right the stone, but succeeds in only propping it up at a pathetic angle. At least, though he is still marked for posterity in some form: sometimes the stones are missing, just gone. As though someone had come up here in the night and taken them. If these were hers, if she were the caretaker, nature’s wrath nor vandals could keep her from repairing and cleaning them; trimming the weeds about their feet. She fancies how they would look on her fruitless back lawn. 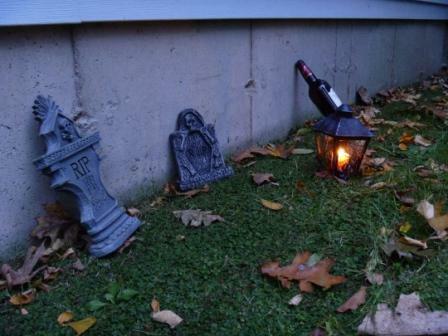 Her own private cemetery, year-round. Great for picnicking in summer and sipping hot chocolate as you watch the snow fall in winter. After she is done, she climbs back into her car and warms her hands by the light of a single candle. She is cold and tired; her legs ache; she is done for another evening. Tomorrow night the moon will wax full, and she will be back. This year, Grave Season is good to her. She works her fingers to their fragile bones and some nights, her rings slip off. She makes sure to pour some Manhattan into the ground near her favorites, because she imagines their greedy voices crying out in eternal thirst and what’s a little spilled booze among friends? Time has no effect. She swills through four hours and her production parbreaks beyond the ink she has in her pens so that she is forced to write in lipstick, sticks in dirt patches, anything she can find. She toasts to her divine productivity as the moon’s golden orb winks behind the gauzy clouds. It is November 5 and she hates this part. 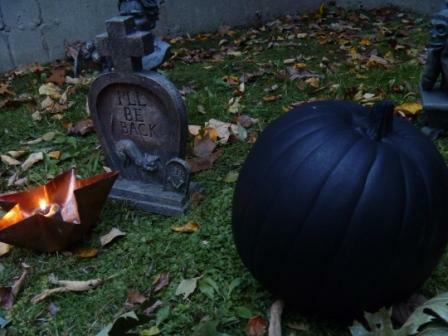 Grave Season is over. She is on the cusp of a too-rushed Christmas Season full of numerous fat-cheeked babies and meaningless run-ins with people she hasn’t seen all year in the mall. She downs four, five Manhattans. She drives home, ever wary that her car suddenly seems to possess the will to pull her toward the unguarded edge of the river. The next morning she opens her eyes with a palsied groan but thinks it is normally brighter in her below-ground hovel. There are shadows shrouding her windows, odd shadows, as though someone had rolled stones in front of Christ’s grave. She lops from bed, her head throbbing from one too many Manhattans. She unbolts the door and ascends the narrow stone stairs onto grass hardened from last night’s frost. Her breath leaks out in crystal-gossamer wisps. They were all there, all the stones, in her yard. ALMIRA, WIFE OF DANIEL A. TREAT OCT. 31, 1888, 56 YEARS 16D AT BEST. A.A.W. the foot stone. NATH’L SMOTE ESQ’R WHO DIED SUDDENLY JANUARY 11 A D 1801 AGED 46 YEARS 10 M’THS & 29 DAYS. Others, all the others. And the twins. The twins are here, too. I swelled wisely in fragility. Today, she knows the answer to that riddle. She knows the answer because it is under her fingernails, black dirt thick as clay. It is in the throb of her right ankle on which she dropped A.A.W. while trying to load it into her hatchback. It is in the searing pain in her knuckles from the clink-clanging of that girly hammer against the railroad spike around the edges of a fallen marker the earth had begun to reclaim. She thinks the answer is the moon. 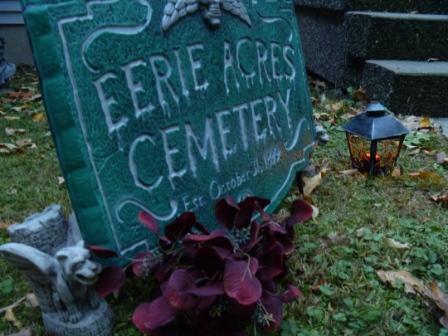 Posted on October 21, 2010, in Deep Thoughts & Fun Stuff, Short Stories and tagged Cemetery, Creepy Dolls, Ghost Stories, Grave Season, Halloween, Short Stories. Bookmark the permalink. Leave a comment.